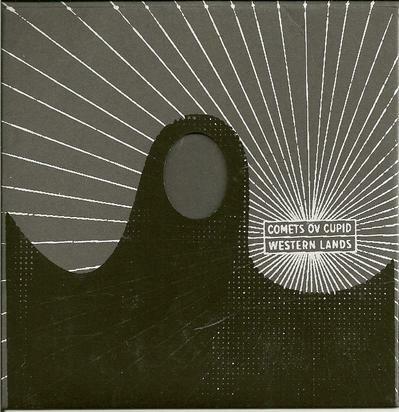 Comets Ov Cupid – "Western Lands"
Minneapolis based Skye Klad evolved from a fuzzed out space rock band to a trippy, psych/folk outfit under the leadership of guitarist/multi-instrumentalist Jason Kesselring. Around the same time as their third (and last) album, Plays the Musick of Cupid's Orkustra Asleep in the Magick Powerhouse of Oz (2004), Kesselring also launched a solo project called Satyrswitch to continue to explore his interest in more acoustic sounds through folk and traditional country songs. Perhaps a play on the name of another band Kesselring was in, Blitzen, Comets Ov Cupid is a solo project from the one time leader of Skye Klad. 2007’s Metalgazer, the Comets Ov Cupid debut EP (also sometimes just credited to Cupid) was a single 20-minute long drone/ambient/metal monster. On his latest, Western Lands, Kesselring draws on all his possible pasts but takes those sounds into exciting new directions. Spectres Ov an Airstream Futuropolis is perhaps one of the more striking album openers I’ve heard in quite some time. It’s a sweeping, eerie and majestic ambient piece that perfectly conjures up the ghosts of some incredible city of the future that never was; the lost soundtrack to Hugo Gernsback’s vision of the shape of things to come. Kesselring then plunges headlong into blistering space rock with cuts like Starship, Babalon, Jack the Rocketman and the instrumental freak out of the title track that recall the fuzzed out rockers of the early Skyklad, but if anything, they up the distortion factor from those erstwhile days to near brain melting levels. Oddly enough though, there is something quite intimate going on here. Kesselring plays all the instruments on the album himself, and often buries the percussion and drum loops deep in the mix, which gives the music less of a band dynamic, and more of a personal feel. This is Kesselring’s journey, to be sure, but fortunately he’s invited us along for the ride. Along the way there are some ambient excursions as well, such as Wanderlust and Ever So Slowly, both deeply layered with fuzzed guitars, organic sounds and strange voices; both unique and different from each other in their own ways. Kesselring also treats us to his acoustic interests, but shies away from the folksiness of Satyrswitch in favour of something a little more esoteric, in the form of the desert blues meets Middle Eastern meditation of Raven Creates the World to the distorted finger picking of the haunting album closer, Moonshot. Despite the presence of some truly intense space rock, there is something deeply contemplative about Western Lands. Like Metalgazer before it, that invited us to stare into the abyss, Western Lands summons you to travel across a bleak and snowy landscape towards a horizon edging upon a star-filled sky…and to whatever lies beyond. Highly recommended!